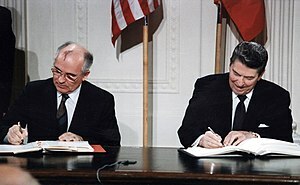 The Intermediate-Range Nuclear Forces Treaty (INF) is a 1987 agreement between the United States and the Soviet Union. It was signed in Washington, D.C. by U.S. President Ronald Reagan and General Secretary Mikhail Gorbachev on December 8, 1987. It was ratified by the United States Senate on May 27, 1988 and came into force on June 1 of that year. The treaty is formally titled The Treaty Between the United States of America and the Union of Soviet Socialist Republics on the Elimination of Their Intermediate-Range and Shorter-Range Missiles. The treaty eliminated nuclear and conventional ground-launched ballistic and cruise missiles with intermediate ranges of 500-5,500 km (300-3,400 miles). In 2012 the United States complained about Russian treaty violations. The two systems that appear to be violations are the R-500, a cruise missile using the 9K720 Iskander launcher, and a short ranged ICBM. In July 2014, the United States formally notified Russia of the breach, while Russian officials called the treaty unsuitable for Russia and unfair because other countries in Asia had such weapons. Russia later attacked the United States by calling American drones a "violation of the treaty". On October 20, 2018, citing Russian non-compliance, US President Donald Trump announced that he was withdrawing the US from the treaty. The U.S. formally suspended the treaty on February 1, 2019, as did Russia the following day. ↑ "U.S. Says Russia Tested Cruise Missile, Violating Treaty". New York Times.com. Retrieved August 31, 2014. ↑ Rogin, Josh (7 December 2013). "US Reluctant to Disclose to All NATO Allies that Russia is Violating INF Treaty". atlanticcouncil.org. Daily Beast. Retrieved 7 December 2013. ↑ Marcus, Jonathan (30 January 2014). "US briefs Nato on Russian 'nuclear treaty breach'". www.bbc.co.uk. The BBC. Retrieved 31 January 2014. ↑ Luhn, Alec; Borger, Julian (29 July 2014). "Moscow may walk out of nuclear treaty after US accusations of breach". theguardian.com. The Guardian. Retrieved 29 July 2014. ↑ Adomanis, Mark (31 July 2014). "Russian Nuclear Treaty Violation: The Basics". news.usni.org. U.S. NAVAL INSTITUTE. Retrieved 31 July 2014. ↑ Pengelly, Martin (2018-10-20). "Trump says US will withdraw from nuclear arms treaty with Russia". The Guardian. Retrieved 2018-10-20. This page was last changed on 5 February 2019, at 21:15.